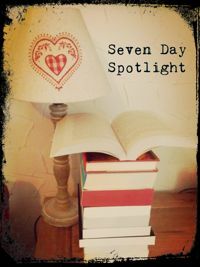 It’s Seven Day Spotlight time again. Where do these weeks go to? In Sheffield the schools now have fixed Easter holidays, being the first two weeks of Easter, so our son is now on holiday. We have a trip to the Yorkshire Wildlife Park planned for this coming week. We haven’t been before so we’re all looking forward to it. 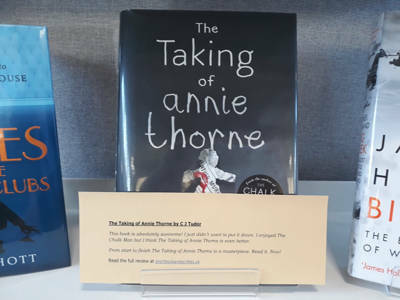 Last week I mentioned that my local library wanted to use my reviews to promote their stock. This week they sent me photos of the books and reviews they are using and reported back that it’s working. 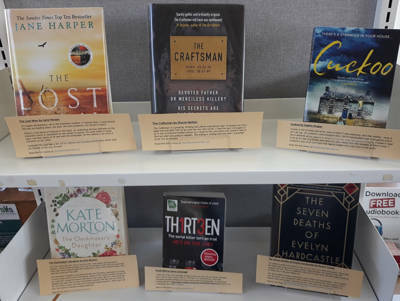 People are borrowing the books and the library are very quickly having to fill in the gaps. This is amazing news and it’s absolutely brilliant to be able to collaborate with them in this way. Oh and yes, the Lego obsession continues. On Monday I shared an extract from My Sister’s Lies by S.D. Robertson. Tuesday was a two post day with an extract from A Country Rivalry by Sasha Morgan and my review of The Courier by Kjell Ola Dahl. Another two post day on Wednesday with my review of The Conviction of Cora Burns by Carolyn Kirby and an extract from Stolen Sister by Linda Huber. Thursday’s post was an extract from Rogue Killer by Leigh Russell. Yet another two post day on Friday saw me sharing my review of The Woman at 46 Heath Street by Lesley Sanderson and an extract from The Hidden Wife by Amanda Reynolds. And Saturday’s post was a guest post by Malia Zaida, author of The Golden Hour, in which she shared her top five favourite reads. Would you like to know what beauties I’ve added to my TBR pile this week? You would? Oh good. 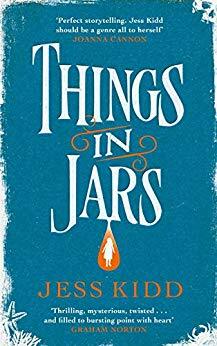 Things in Jars by Jess Kidd – this is a pre-order because I just really fancy this book. 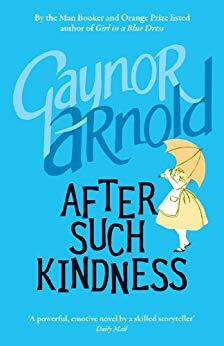 After Such Kindness by Gaynor Arnold – this was recommended to me by Carolyn Kirby after I loved The Conviction of Cora Burns. Apparently it was one of the books that inspired her. When the writer, Oxford scholar and photographer John Jameson visits the home of his vicar friend, he is entranced by Daisy, his youngest daughter. Jameson charms her with his wit and child-like imagination, teasing her with riddles and inventing humorous stories as they enjoy afternoons alone by the river and in his rooms. The shocking impact of this unusual friendship is only brought to light when, years later, Daisy, unsettled in her marriage, rediscovers her childhood diaries hidden in an old toy chest. Inspired by the tender and troubling friendship between Lewis Carroll and Alice Liddell, After Such Kindness demonstrates Gaynor Arnold’s extraordinary ‘capacity to imagine the truth behind the facts’. With the same assured feel for the Victorian period displayed in her prize-listed debut, Arnold brings to scintillating life an idiosyncratic genius and his timeless muse. Spring Comes to Emmerdale by Pamela Bell – I loved Christmas at Emmerdale so treated myself to this one. 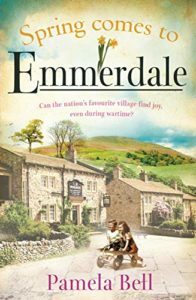 Spring Comes to Emmerdale is a must for fans of ITV’s Emmerdale, and readers who love heartwarming and heartbreaking stories set during wartime, alike. World War I wages on, and the families of Emmerdale are trying their best to move on from tragedy, while the effects of war still resonate throughout the village of Beckindale. Though grief and loss permeate, Maggie Sugden, Rose Haywood and the other inhabitants of the village are finding independence, the chance to make their own happiness – and even opening themselves up to find love. Featuring firm fan favourites like the Dingles, The Woolpack Pub and Emmerdale Farm itself, this will be a delight for any Emmerdale fan. Following on from the first in the series, Christmas At Emmerdale, the second novel picks up where the first left-off, exploring the lives of Emmerdale’s much-loved families during the Great War and beyond, and how the nation’s favourite village copes with the loves and lives lost. 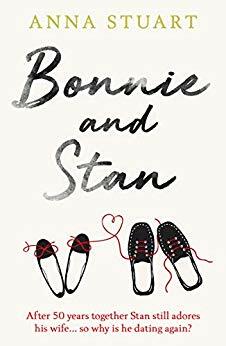 Bonnie and Stan by Anna Stuart – I love the sound of this one. After 50 years together Stan still adores his wife… so why is he dating again? Bonnie and Stan are soulmates. They met during the Swinging Sixties, to the soundtrack of The Beatles and the Merseybeat scene. Now they’ve grown up and grown old together, had children and grandchildren. They are finally building their dream home, when disaster strikes. Bonnie & Stan is a poignant, surprising love story set during the Swinging Sixties and the present day. Ultimately feel-good and full of emotion, Bonnie & Stan will make your heart sing. In the Night Wood by Dale Bailey – a competition win from Harper Voyager. A FOREST. A BOOK. A MISSING GIRL. Charles Hayden has been fascinated by a strange Victorian fairy tale, In the Night Wood, since he was a child. When his wife, Erin – a descendant of the author – inherits her ancestor’s house, the couple decide to make it their home. Still mourning the recent death of their daughter, they leave America behind, seeking a new beginning in the English countryside. But Hollow House, filled with secrets and surrounded by an ancient oak forest, is a place where the past seems very much alive. 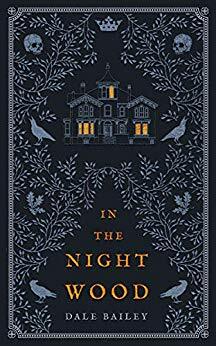 Isolated among the trees, Charles and Erin begin to feel themselves haunted – by echoes of the stories in the house’s library, by sightings of their daughter, and by something else, as old and dark as the forest around them. A compelling and atmospheric gothic thriller, In the Night Wood reveals the chilling power of myth and memory. 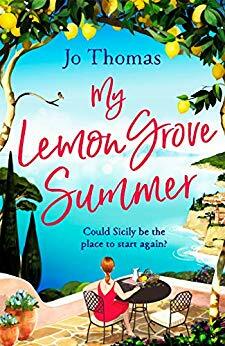 My Lemon Grove Summer by Jo Thomas – I am the most humongous fan of Jo Thomas’s writing so I did a little happy dance and a squeal when I received this proof of her next book. Can’t wait to read it. Could the lemon groves of Sicily be the perfect place to start over? The irresistible new novel from Jo Thomas, the author of Sunset Over the Cherry Orchard, will transport you to the island of mountains and sparkling blue seas. When life hands you lemons … is it ever too late for a second chance? Zelda’s impulsive nature has got her precisely nowhere up until now. A fresh start in a beautiful hilltop town in Sicily looking for new residents, together with her best friend Lennie, could be just what she needs. And who better to settle down with than the person who knows her best? Could a summer in Sicily help Zelda learn to trust her instinct and follow her heart? The Gift of Friends by Emma Hannigan – this is bittersweet as it’s the author’s final book, completed just before she passed away. 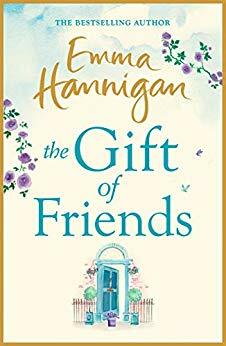 From the Number One bestselling author Emma Hannigan comes her new novel, The Gift of Friends, a magical story of love, friendship and hope. In fact, each of the other four women who live close by has a secret, and each is nursing their own private heartache. Blackpool’s Daughter by Maggie Mason, aka Mary Wood, another of my favourite writers. So looking forward to this. Separated from her mother, far away from anything familiar, she is at the mercy of a cruel shopkeeper. Clara is worked like a dog, but the warmth of her Blackpool friendships will go far to save her. Julia just wants to find her beloved daughter – but the trials of war will keep them far apart. 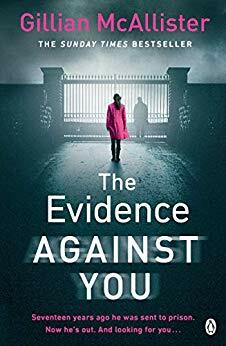 The Evidence Against You by Gillian McAllister – this will be my first book by this author. I’ve only ever heard good things about her writing. It’s the day Izzy English’s father will be released from jail. She has every reason to feel conflicted – he’s the man who gave her a childhood filled with happy memories. But he has also just served seventeen years for the murder of her mother. Now, Izzy’s father sends her a letter. He wants to talk, to defend himself against each piece of evidence from his trial. But should she give him the benefit of the doubt? Or is her father guilty as charged, and luring her into a trap? 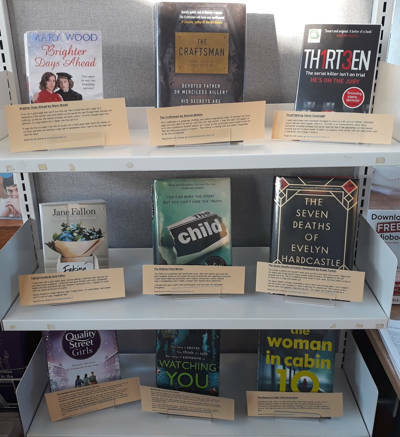 I LOVE that your library is using your reviews!!! This is simply brilliant! Thanks, Meggy. I feel really honoured! A couple of those sound like crackers, but Things in Jars sounds the most appealing. I absolutely love the collaboration with the library! Thrilled to hear it’s working too! Thank you! Yes, hope it continues to work for them. Lots of great books added to your TBR! Bonnie and Stan jumped out at me as a cute read. I am still trying to get to my first Gillian McAllister. I have Everything But the Truth waiting patiently for me on my shelf. I was over the moon when the library asked me. It really is a great idea. A look at my list of books tells me I have all of Gillian McAllister’s books on my pile so it’s really a very good job I’m going to be reading her latest one for the blog tour very soon!